Despite heavy snow falls earlier in the day, nothing was going to stop The Fiddle Workshop’s Burn’s Night. Tables set, pans of haggis, neeps and tatties steaming in the kitchen and a packed hall of musicians and friends. What could be better? The Fiddle Workshop once again surpassed itself. 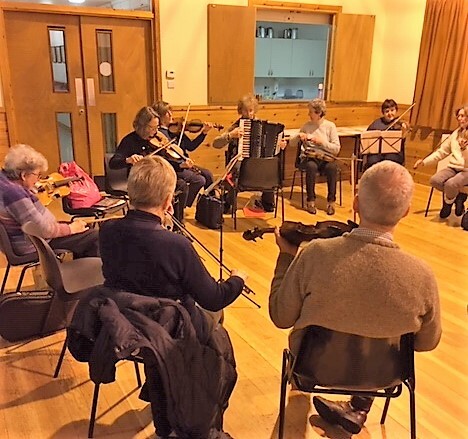 The evening started with a mixed instrument session playing several Burn’s tunes including ‘Ae Fond Kiss’, ‘Red, Red Rose’, and ‘Ca the Yowes’. Fiddle tutor Mairi Voinot played the fiddle as the haggis was brought in and Alison Duncan made the address. A traditional feast was then enjoyed, along with a dram or two. As tea and coffee were served Anne Craig recited (complete with actions) Robert Burn’s poem ‘Sic a Wife as Willie Had’. She received a loud applause. Alison Duncan sang her own composition ‘The Death of Baron McIntourner’. The Baron was an ancestor of local resident, Cathie Montgomery and Alison sang the story of his life and death. McIntourner was awarded the Barony of Craigcoll (by Glen Finnart) by Robert the Bruce. This title was passed down through the generations. In 1685 Baron Hugh McIntourner, whilst on his way to Whistlefield, was murdered by supporters of the Campbell clan. There are still the remains of a cairn, erected in remembrance of Baron Hugh’s death, between Whistlefield and Ardentinny. Over the centuries the name McIntourner changed until it finally became Turner. Mairi Voinot played the slow air ‘Prince Charles Last View of Scotland’. If you haven’t heard this tune before, you’re missing out. Finally, with full tums and jovial mood, a great music session took place. 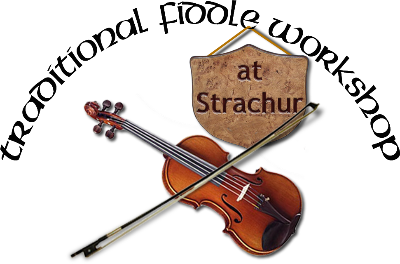 Thanks to all for making The Fiddle Workshop Burn’s Night a night to remember.